[CONT](VC) Generation Break 2 (This ability is active if you have two or more face up G units in total on your (VC) or G zone):All of your units get "[CONT](VC/RC):During your turn, if you have a unit with the same card name as this unit on your (VC) or (RC), this unit gets [Power]+5000.". 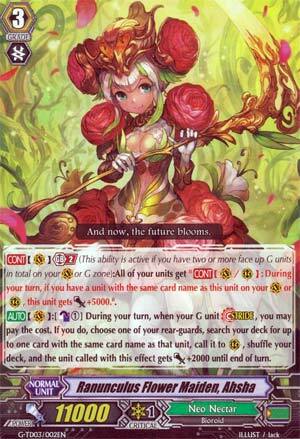 [AUTO](VC):[Counter Blast (1)] During your turn, when your G unit Stride, you may pay the cost. If you do, choose one of your rear-guards, search your deck for up to one card with the same card name as that unit, call it to (RC), shuffle your deck, and the unit called with this effect gets [Power]+2000 until end of turn. ...Guess what. You don't get to upgrade this deck any further until May. Sorry. So what we've got here is the GB2, on-stride ace for Neo Nectar. On Stride, you select a rearguard, and call from the deck a unit with the same name, for CB1. The new unit also gets 2k power for that turn. Generation Break 2 ability? To power up all units that have a clone of themselves somewhere on your board by 5k during your turn. ...Well, it's certainly got a better trick that most of the other Neo Nectar aces, but to be honest, I'm not feeling it. Again, the Generation Break ability is too slow, and setting up a consistent field seems to still be the only trick it can pull, save for a column game. Most of the new stuff is going towards more calling, and once the field is full it'll be sitting on its laurels doing not very much compared to other aces who can end a game on their own merits. Cost's fair, but I want something a little harder hitting than this, or maybe some more rear-guards that have on-hit skills besides just more units when I already have enough. And winner of the best tongue twister name is Ahsha! and the lore mentions she's one of the first Neo Nectars with power on par with royalty. Huh, go fig. When you Stride with Ahsha in the heart, you can CB1, choose a unit in the Rear guard and superior call a copy of it from the deck and give the new unit +2000 for the turn. Huh, that's pretty neat actually, filling up the rear guards in a nice, neat way. What about the GB2 skill? Oh, nice. So, to make it simple, if you have 3 boosters with the same name, they all get +5000 power and if you have another Ahsha in the rear guard, both the rear guard and vanguard versions of Ahsha get +5000 for the turn. That's really good, very solid and a nice way to induce a Final Turn very quickly. Not much I can say, it's very similar to Paladin decks, but plays differently enough that comparing them doesn't work.